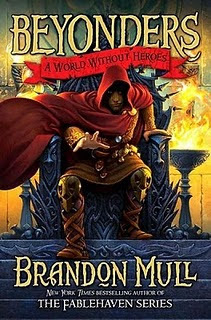 The latest and greatest Brandon Mull book (author of the Fablehaven series and The Candy Shop War) hit the shelves not too long ago. I've read all of Mull's books, and I must say, after I got about halfway into Heroes, I enjoyed this one best. For whatever reason, it wasn't grabbing me from the get-go. Maybe I'd gotten out of the habit of reading. Maybe it's impossible to get into a book when one has only two-to-five-minute snatches of time in which to read. Maybe I wasn't convinced that I was ready to invest myself in learning about and caring about a whole new middle-grade fantasy world (this is the first book in a slated trilogy). In any case, I (eventually) enjoyed the fast-action pacing, the likeable (if somewhat unbelievable) main characters, and the plot twists that kept me guessing until the last chapter. The book has a very strangely quirky beginning for what turns quickly into a serious story. Jason, age thirteen, works at a zoo. Cleaning by the hippo cage one day, he hears music coming from ... inside one of the hippos? Leaning closer to investigate, he falls in, gets swallowed by the melodious water horse, and ends up in another world, where he suddenly finds himself on a seriously dangerous quest, accompanied by another young "Beyonder," Rachel, to recover all the syllables of the one word that can undo the purely evil magician/dictator who rules it. I say the characters are slightly unbelievable because they are a little too well-spoken and mature for your average thirteen-year-old. Which is not to say that thirteen-year-olds aren't either of these things. These kids just come across as college professors on occasion. Still, entertaining book. I'll definitely read the sequel, but I won't be dying for its release. Must admit that I liked Fablehaven more. Maybe I liked the characters more in that one. At least this didn't creep me out the way The Candy Shop War did!